Sitting down to plan out the upcoming week helps me get centered and ready for what’s ahead! I just can’t say goodbye to my paper planner. I use Google Calendar to organize my schedule and the kids’ activities. That is synced with Plan To Eat so I know what I’m cooking. And Plan To Eat keeps track of my grocery lists. But for my Day-to-Day To Do lists and weekly planning, Planner Pad has been by my side for years. 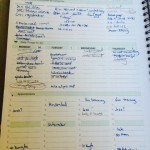 They recently introduced an app and electronic version, but I’m still loving the paper planner. I have varied between the Executive size and the Personal size over the years, depending on my needs, but I always get the dated spiral bound version. 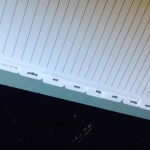 I don’t ever get them personalized, but I do add the monthly dividers, the Day Marker and an Insta-Pocket. My planners are my brain organizers, but also my records. I have had to dig them out to find information from past years. Or go back a few months to remember who I talked to at some company that is now giving me some kind of trouble. Mine isn’t exactly neat, but it keeps me organized. Some weeks are messier and have less white space than others. Work categories, such as Editing, Graphics, Marketing, Phone Calls, Cold Calls, Samples, Manufacturing, Sewing, Proposals, Brainstorming, etc. 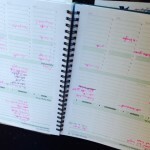 I have always loved that no matter where I am in my life and what’s going, this planner works. I’ve used one for about ten years now, from when The Captain was in school and we had infants, a very different time in my life, to now. 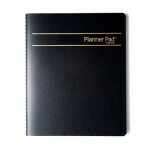 Take a look at how and why Planner Pads work! You can even color code for different kids, subjects or categories. Or just for fun!